looking for something else I was very surprised to see a noticeable temperature difference (If I understand band31 correctly) between water and ice at the ice arch and in front of Humboldt glacier. Usually I find ice and water indistinguishable in band31 but here water flowing under the arch seems cooler (darker) than the ice whereas slightly further south there is warmer (lighter) water right between the ice floes. Elsewhere I would interpret this as river water but here the most likely source would be meltwater exiting below the glacier? Flip to Aqua to see some cracks in the Lincoln Sea also. Oh, very good catch. You know, I had spotted the cracks in the Aqua image but didn't bother to try to look past the clouds in the Terra image. Taking a closer look now, and blinking against images of a few days ago, the ice not only has new cracks but has noticeably bulged to the south. (Sorry I don't have an animation to show.) Hopefully we'll get a better look in several hours. Thanks Sonia, and Espen. Where do you get hold of such recent Landsat images? I suspect all the recent cracks are full moon /extreme tides but the ice looks like broken glass all the way into Lincoln. Soon be gone. Good catch. The Arctic Cap HYCOM thickness graphics seem to suggest the ice around the top of the Nares is 5m thick. Is that possible? The current images don't give the impression of such massive ice structure. Of course viewed from space you can't see thickness but it looks so fragile. 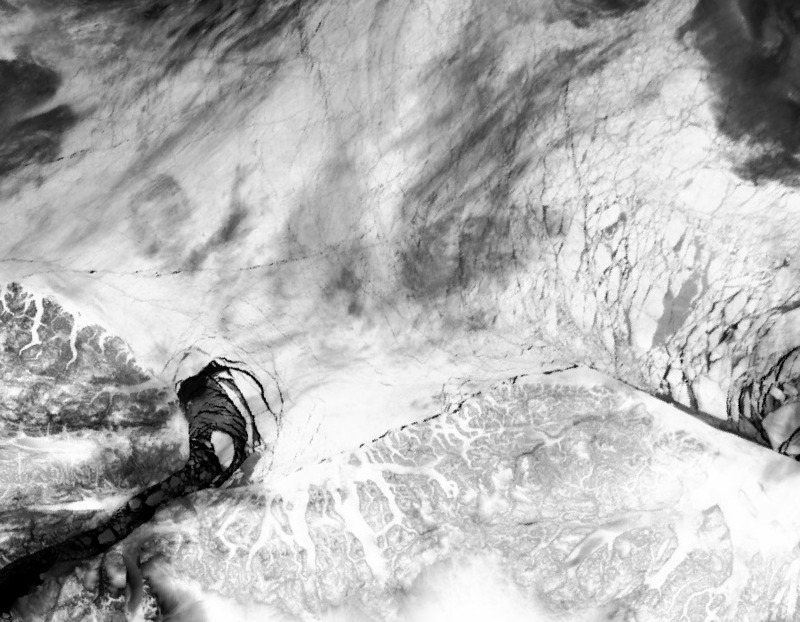 Here's a view from space that suggests that the ice around the top of the Nares isn't all 5m thick. The images also show how the ice is always full of older cracks which allow it to move and are renewed by that movement. So ice average icethickness (better to look at icebridge data than HYCOM for that) is giving a measure of the thickness of shifting floes not a solid slab of ice. The movement also produces ridges by tilting floes sideways which add to the average thickness. The southern (southwestern actually) end is also breaking up. Hans Island is just covered by the cloud bank where the recent ice bridge held for a few days. Ice has broken up 10 or 15 kilometers northwards of there. It's interesting that although the "Stopper" is fractured, it's still more or less in place. Is the Lincoln Sea ice melting away in a polynia as opposed to being advected through Nares? you see there is quite a bit of movement of the stopper within some hours. On the Lincoln side of it is first year ice which formed only at the end of december but doesn't look like melting away yet. Here's the latest, lot's of disintegration! Cracks developed close to Petermann Fjord, this afternoon. Nares Strait is almost like when IKEA is opening one of their shops in a new market, the run is from above! Nothing may be getting out but much of it is moving south. Seems like there are four floes roughly 10km in size in the southern 60km. They look like some of them moved around 5km in the 2 days. The southern most one did seem to move north though. Ice really is moving north through the Robeson Channel currently. Clouds over the Nares have made ice watching frustrating lately so I was eagerly awaiting today's radar images on the DMI site. They're here now, and though maddingly missing data across the Hall basin, reveal interesting ice movement. If you blink against images from the 19th you see that while ice (including remnants of the sturdy stopper) is lazily floating south through the Kennedy Channel, it is quite clearly moving north through the Robeson! That should ease the Ikea traffic jam, if we could only see it. Looking farther up into the Lincoln Sea shows a rip where is ice is moving north on the west side of the sea and south on the east side. Check your favorite source of surface wind data (I really like earth.nullschool.net) for insight into this. Brisk winds are blowing straight up the Robeson and west Lincoln Sea driving this ice return. A little farther south in the Kennedy, winds are not as strong and apparently do not overcome the drag of the current flowing south. Certainly still flowing from the "blockage" south, from what I can see in DMI Terra/Aqua images 20-22 July. Ice movement and/or in situ melting, as well as a colour change to stronger blues in remaining ice. Petermann fiord appears to be clearing out rapidly also. Not strange, but interesting. There are two currents in Nares Strait and like most Arctic passages the traffic stays to the right. The southerly current is usually much larger and stronger. At least two gyres occur, one in Kane Basin and the more prominent in Hall Basin where large chunks of ice will often go around 2 or 3 times before breaking free. Winds in the steep walled canyon can be extreme as Dr. Munchow discovered when his anemometer was destroyed, but thick ice is usually directed more by current than by wind. Terry, do we have any info regarding the P2s? I lost track of half of it (Maybe broke up), but the other half was near Lancaster Sound and Pond Inlet (NW Baffin Bay) yesterday. 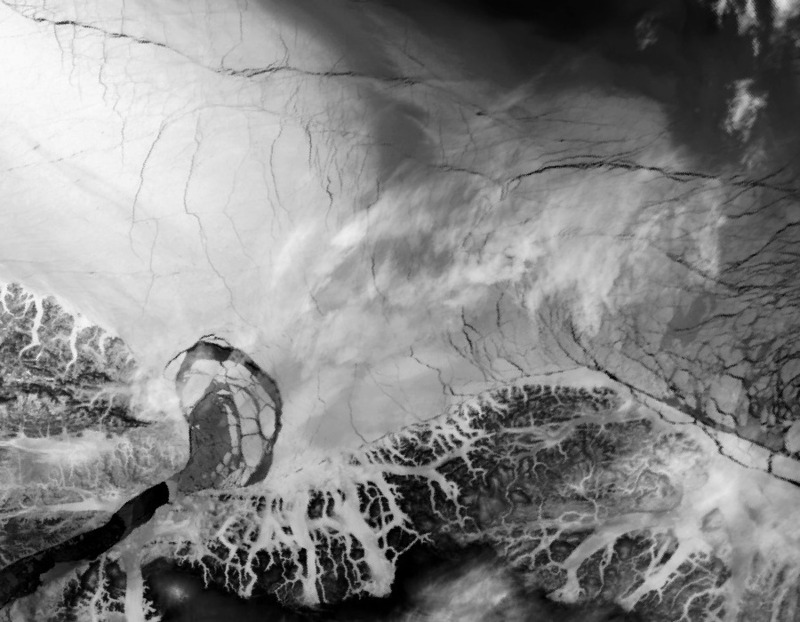 The Canadian Ice Service is tracking as many of the ice islands as possible. The attached is what I received last week, more detail in RadarSat, but those data/imagery are not easily shared as it may violate copyrights. Edit: "Kane Basin" should read "Lincoln Sea" in the circled bit at the northern edge. It probably indicates glacier ice from either Ryder or Steensby Glaciers that discharge into the Arctic Ocean to the north of Nares Strait. Thanks Andreas. That makes life much easier! Thanks Andreas! I have tracked some using Worldview, but it gets difficult at times. Whoa ... not so easy to track individual floes just a few days apart. A lot of break-up in the narrows. I've added a few more floes with fairly high confidence but still cannot account for the origin of everything in the Strait. The idea with the translucent gradients was to define a directional polarity axis in the 'before' flow so any rotation would be evident when the gradient was applied in the same orientation to the 'after' floe. However I didn't manage to do this very consistently. The break-up of floes isn't too surprising. These floes are all conglomerate, and the "glue" between multi-year pieces is only thin First-year yet, so it doesn't take much to fracture them. I note the Dec 1 DMI Sentinel-1 image (http://ocean.dmi.dk/arctic/kennedy.uk.php) shows the big 'red/orange colored' floe has moved quite a bit (5 or 8 km? since Nov 30) . I hope to keep watching in order to see where it breaks up, slips through or gets stuck (or combinations of the three). It sure is 'steaming' along: about 25 km in one day, on 2014-12-03 it was in Hall Basin off Ellesmere Island's Lady Franklin Bay (functionally opposite Petermann Glacier). Today it will likely glide past Joe Island. On Friday (at this rate) it will run into Hans Island and stop/split/splinter. Hmmm, if a block of ice hits a rock hard enough, will any steam be produced? Thanks for the animations, A-Team and Espen! I wonder if there are any quake sensors at Hans Ø? Do we have an idea of the usual speed of the ice at that time ? It sounds to me very fast ! ?